Made to be economical and easy to change. Easy to install to doors or walls. Text can be in your colour. Can be used with other Slider signs to form a directory. These signs are easy to use, have changeable or slide able inserts and will attach to any door or wall. They are designed to be an economical option and an easy way to provide changeable information to an office door. 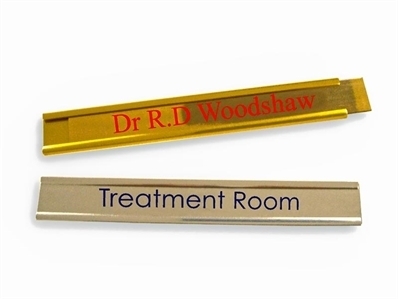 They can be used as a slider to denote when a room is busy or can also be used as a changeable name sign when a room's use might be changed or occupied by different staff members at varying times. These signs are made from aluminium with either a rigid plastic or aluminium slider/insert option.